Current surgery and anesthesia literature stresses patient eye as well as face protection in the operating room, especially in da Vinci surgery (see references), yet there are no published standardized guidelines nor position statements by the Joint Commission or Det Norske Veritas (DNV). Most hospital anesthesia safety guidelines do not specifically address this aspect of patient safety. The patient’s face under general is typically uncovered, exposed, and at risk of injury, especially the eyes. Any injury can have serious consequences for the patient, surgeon, anesthesiologist, hospital, and accreditation. The risk of face and eye injury (about 1 in 1000 procedures) is greater than unintentionally leaving something behind in the patient during surgery (about 1 in 5000 surgeries). Protecting the patient’s eyes and face during general anesthesia is important to prevent injuries, especially if the face ends up covered or obscured by surgical drapes. This happens commonly during Laparoscopic, da Vinci robot surgery, shoulder and breast surgery. A standardized patient protection device for eye and face safety in the operating room dedicated to the supine (face up) position patient. It has great value for patient protection in da Vinci robotic, laparoscopy, breast, and beach chair shoulder surgery cases. This is a simple device to protect adult eyes and surrounding areas under General Anesthesia in the Supine (face up) position. It is used with Endotracheal (ET) or Laryngeal Mask Airway (LMA) anesthesia. The device is a single use patient protective eye shield which provides a practical, safe, intuitive, easy-to-use and cost effective shield to protect the eyes and surrounding areas during general anesthesia surgery in the face-up position. Every member of the operating team is required by OSHA and JCAHO guidelines to have face/eye protection. Yet, the patient is the only person in the OR without that same sort of protection. The device is constructed of fire retardant medical grade transparent plastic and latex free foam padding. It is held in place on the face with a simple retaining latex free strap. Alternatively, it can be secured using the behind-the-head anesthesia mask harness straps, ubiquitous in all operating rooms. 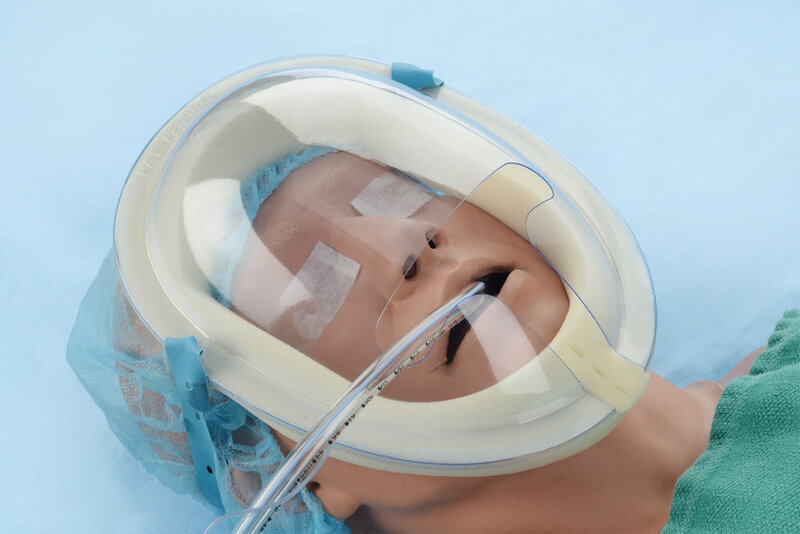 The device is easy-on, easy-off: Contoured cut-away T-opening for Endotracheal or Laryngeal Mask Airway tubes and with a unique foam break-away feature which allows rapid removal of the device without disconnecting the anesthesia airway circuit. Its transparency allows easy view of the entire face. If the face, as frequently happens, is covered by the surgical drape, this device provides a protective barrier for the face. The device has been used safely in hundreds of laparoscopic and da Vinci general surgery, urologic, and gynecologic operations as well as orthopedic (shoulder) procedures. In da Vinci cases there is unanimous consensus for and the use of the device where eye and face protection are particularly important. It has met and exceeded our expectations. Copyright © DOMA Patient Safety Products, LLC. All rights reserved.